Many teachers and school leaders are familiar with Assessment for Learning – using classroom assessment to directly contribute to the learning process. This presentation explores successful AfL classroom practices. It focuses on good diagnostics, clarity about learning, and feedback. Involved in each of these is skilled teacher communication and learner self-regulation. How teachers interpret this in practice varies widely – from a range of informal classroom practices (eg dialogue, self and peer assessment) to a narrower approach which uses test results to inform learning. This presentation provides a definition of AfL: ‘gathering evidence to identify where learners are in their learning, where they need to go, and how best to get there’ (Assessment Reform Group, 2002). The presentation then looks at the classroom practices it encourages: finding out what learners know as the starting point for further learning; helping learners understand what they are learning and why; providing feedback which moves their learning forwards. Examples of classroom practices are provided for each of these. Diagnose: AfL is about skilful and informal diagnostics to identify strengths and weaknesses in what students know and can do. Effective learning builds on what we already know. Be clear: AfL is about teachers being clear about what is being learned, what success looks like, and communicating this to learners. Be specific: AfL involves effective feedback which offers specific information about how learning can move forward, and allows opportunities to put the feedback into practice. 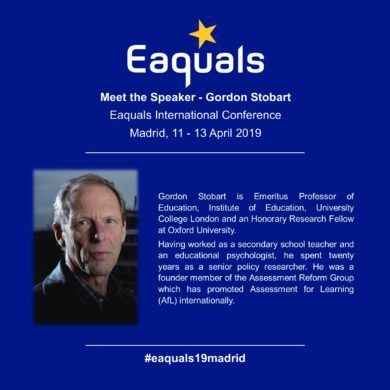 Click here to register for the Eaquals International Conference.